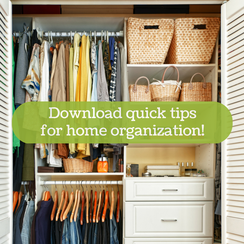 Cut the Clutter and Organize Your Home! If you recently put the ideas from the post Tips and Tools for a Pre-PCS Cleaning into use, you may be need some ways to cut the clutter before you get to the actual cleaning! 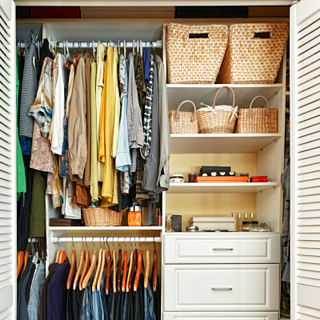 Looking for ways to organize your home? Consider these 6 ideas to keep clutter at bay. Tip #1: Keep important papers somewhere easy to see. Hang a decorative clothesline of sturdy twine and clip papers to the line with colorfully painted clothespins. Magnet paperwork on a dry erase board. Using colorful pushpins, hang papers on a bulletin board. File papers into a group of plastic magazine holders. With options for sorting the paper around your house, you may spend less time looking for important mail or crucial paperwork. Tip #2: Consider starting a habit of opening your mail near a paper shredder or a recycle bin. That way, when unwanted paper arrives, you can dispose of it immediately. Tip #3: Sort the contents of your desk drawer to find things with ease. Repurposing something as simple as round tin tuna cans placed side by side or stacked in a drawer may hold loose desk items such as paper clips or rubber bands. For larger desk items such as a pad of sticky notes or a stack of business cards, pick up a batch of individual mini loaf pans. Often sold in packs of 30-50, these sturdy little cardboard rectangles may help keep the contents of your drawer from sliding around. When you pull open a drawer and are able to find items easily, you may revel in your sense of organization! Tip #4: Keep track of important receipts. Consider purchasing file folders, or an accordion file, or simply a plastic tote with a lid. Having a consolidated spot for all important receipts will have you feeling more organized in no time. Tip #5: Have a gathering bin for items that belong to each person in your household. Maybe it’s a basket just inside the door of each person’s bedroom. Or try designated storage cubes under the bench in the hallway. Whatever your preference may be, explain to each member of your family that any loose items found around the house will be gathered into their specific bin. When items have a "home," a place where they may be neatly stored, there may be fewer worries over misplaced goods. Tip #6: Try the “Four Box” system when going through clutter. Now, turn on some good music or your favorite Netflix binge, and tackle the clutter around you. Each item you pick up needs to go in one of the four boxes. When everything has been divided up, immediately take out the trash – this will prevent any second-guessing on what you’ve tossed. On a similar note, if items were placed in Box 2, it’s time to let go. Look online for the best place to donate or sell your items and do so in a timely manner. Go around your home and place the items from Box 1 back where they belong. Find new spots for the items in Box 3. Or, make a list of the contents of the box and store those things. This box-by-box process may make the de-cluttering more efficient. The act of sorting through the items that surround you may help you feel better about the potential of your living space. And if you have a PCS approaching, once the clutter is cleared, you'll find it easier to tackle those cleaning tasks you'd been putting off! For more home organizing tips, click below!